Kanban Signs is a full-service sign company that specializes in vehicle graphics. 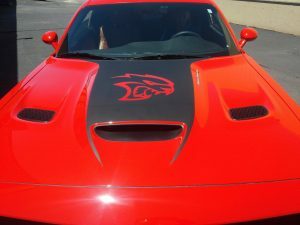 We understand that vehicle decal application is no easy feat. It requires keen attention to detail and years of experience. The good news is that Kanban Signs has exactly that! And we’re excited to work on giving your car, truck, or van a decal that speaks your business message and fits your budget. Kanban Signs can help you make your vehicle the perfect advertising canvas. 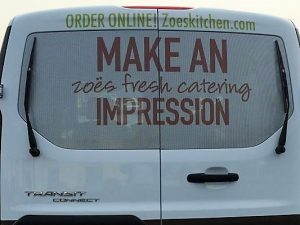 We offer high-quality perforated decals that allow your vehicle’s side and rear windows to accommodate impressive designs without compromising the driver’s view. By diffusing very bright light, they also help reduce glare and harsh shadows. Having been in the sign-making industry for a long time, Kanban Signs understands the importance of cohesive branding. This can get a bit difficult when you have your business advertising on wheels. But at Kanban Signs, we make sure that wherever your vehicle goes, your brand identity goes with it. Clear vehicle decals are perfect for bespoke mobile graphics. 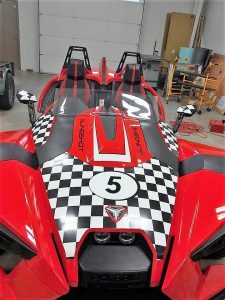 Clear decals are transparent on areas that are not printed, and so they give you the freedom to determine the size, placement, and overall look of the design on your vehicle. Kanban Signs’s decals can even produce a clean, professional look similar to die-cut vinyl lettering, but for a more affordable price. If you have a design already, you can send Kanban Signs your design file and we can print it out for you in transparent vinyl and then take care of application. If you don’t have a design yet, our trusted team of graphic artists can definitely help you come up with a decal design that suits your brand and budget. Kanban Signs helps your business stay updated when it comes to signs and advertising. To meet this need, we offer opaque vehicle decals that are affordable, can be removed hassle-free, and can come in various shapes and sizes. They are durable, attractive, and affordable enough to be used on a short-term basis. Many businesses get into a sticky situation whenever they want to get their mobile graphics changed or updated. 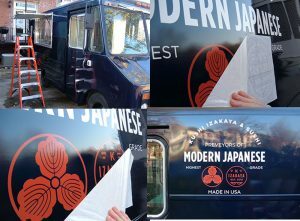 But with the quality of vehicle decals that Kanban Signs provides, you can expect a quick and clean experience when updating your vehicle’s look. 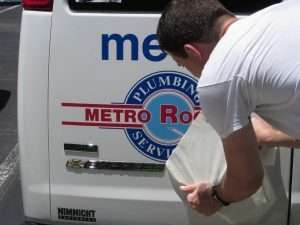 We use decals that do not damage your vehicle’s glass or paint and do not leave messy residue behind. Kanban Signs is passionate about producing high-quality vehicle graphics, and we are committed to helping our clients throughout the entire sign-making process. We have project managers who can help you with organizing and pacing the project, artists who help convert your ideas to effective designs, printers and decal experts who help bring your ideas to life, and support staff who make sure that you stay happy. If any of our services sounds interesting to you, but you’re not quite sure where to start, Kanban Signs is here for you. We would be more than happy to help give your business a boost by finding the perfect vehicle decal for you. We will start by talking about what you’re looking for in a mobile graphics design and we’ll take it from there. Call Kanban Signs today at (619) 503-3634 for your Free Consultation with a Vehicle Decals Expert!